President Donald Trump congratulated Brian Kemp on his victory in Georgia's Republican gubernatorial primary Tuesday, calling his Democratic opponent a lover of crime and open borders. 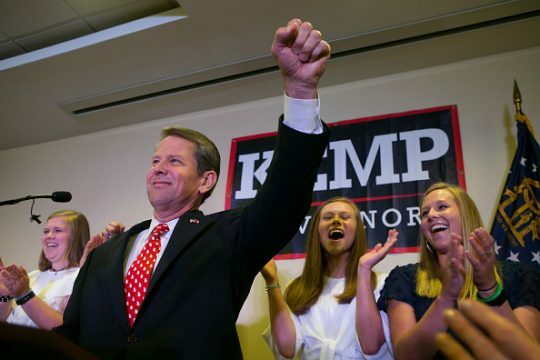 Kemp, the current Georgia secretary of state, routed Lieutenant Gov. Casey Cagle in their runoff election on Tuesday, winning by nearly 40 points. Cagle entered the crowded GOP race a heavy favorite with a large fundraising advantage, but Kemp was buoyed by a late endorsement from Trump and had a winning message as a "politically incorrect conservative." Trump ripped Democratic nominee Stacey Abrams as "weak on Vets, the Military and the 2nd Amendment" as he offered kudos to Kemp. Abrams is vying to become the first black female governor in the country's history. "Congratulations to Brian Kemp on your very big win in Georgia last night," Trump tweeted. "Wow, 69-30, those are big numbers. Now go win against the open border, crime loving opponent that the Democrats have given you. She is weak on Vets, the Military and the 2nd Amendment. Win!" Kemp drew national attention with one tongue-in-cheek ad where he pointed a shotgun at a young man trying to date one of his daughters, promoting his support for gun rights. He also produced an ad where he said he would drive around in his pickup truck to possibly gather "criminal illegals." Democrats have long had their eye on flipping Georgia blue. The state has been a Republican stronghold for 20 years, voting for the GOP presidential candidate in every race since 1996. Trump defeated Hillary Clinton by only 5 points in 2016, however; in 2012, Mitt Romney beat Barack Obama by nearly 8 points. No Democrat has won the Georgia governor's race since Roy Barnes in 1998. Kemp wasted no time Tuesday in painting his opponent as a liberal with deep-pocketed, out-of-state interests backing her candidacy. "Hillary Clinton, George Soros, and Nancy Pelosi all have Georgia on their mind," Kemp said. "For months, they’ve been campaigning for Stacey Abrams, the out-of-touch radical liberal who cares more for her billionaire backers than for you all." Abrams has defended her out-of-state contributions because of what she calls Georgia's status as a "national state." This entry was posted in Politics and tagged Georgia, President Trump, Stacey Abrams. Bookmark the permalink.